Starwood Hotels & Resorts Worldwide, Inc. (NYSE:HOT) today announced the signing of an agreement with Residency Resorts Mal’e Private Limited, part of the Chennai-based leading property developer, Appaswamy Group, to debut the renowned St. Regis brand in the Maldives. 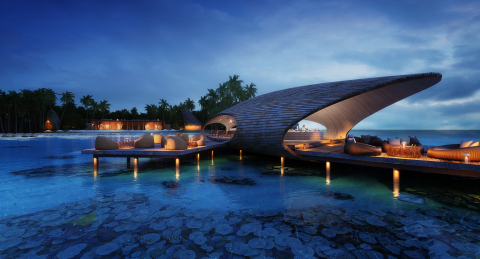 Set to open in 2016, The St. Regis Vommuli Resort, Maldives will bring the brand’s hallmark luxury services to one of the world’s most magnificent destinations, ideally situated on the private Vommuli Island in the Dhaalu Atoll. A 40-minute seaplane ride southwest from the Republic’s capital city Mal’e, The St. Regis Vommuli Resort will be located on a private atoll spanning more than 20 acres, surrounded by unspoiled beaches and a secluded lagoon with sparkling turquoise waters. The resort will feature 77 luxuriously appointed private villas, all with a distinct contemporary design scheme inspired by the island’s natural materials and color palette. Guests will have access to a tranquil spa with six private treatment rooms; an infinity swimming pool; state of the art fitness center and yoga space; as well as a dive and activity center. With an all-day dining restaurant, three specialty restaurants and a signature bar, The St. Regis Vommuli Resort will also offer guests rich culinary experiences including the legendary Bloody Mary cocktail, which was first created at the flagship St. Regis New York hotel in the 1930s and is served at each of the brand’s 34 hotels and resorts around the world. This announcement follows on the heels of the recent signing of The St. Regis Mumbai, which is scheduled to open before the end of the year. The St. Regis Vommuli Resort will further strengthen Starwood’s fast growing portfolio in South Asia, where the company currently operates 48 hotels with an additional 48 hotels in the pipeline, including W Goa Retreat & Spa and Le M’eridien Nagpur in India; Le M’eridien Paro, in Bhutan; Le M’eridien and Sheraton in Dhaka, Bangladesh and Sheraton in Colombo, Sri Lanka, all due to open in the region within the next two years. The St. Regis Vommuli Resort joins Starwood’s dynamic local portfolio that includes W Retreat & Spa – Maldives and Sheraton Maldives Full Moon Resort & Spa. Combining classic sophistication with a modern sensibility, St. Regis is committed to delivering exceptional experiences at over 30 luxury hotels and resorts in the best addresses around the world. Since the opening of the first St. Regis hotel in New York City over a century ago by John Jacob Astor IV, the brand has remained committed to an uncompromising level of bespoke and anticipatory service for all of its guests, delivered flawlessly by signature St. Regis Butler Service. From Bal Harbour to Bangkok, Saadiyat Island to Shenzhen, the St. Regis brand caters to a new generation of luxury travellers and continues to thoughtfully build its portfolio in the most sought after destinations at the heart of today’s grand tour. Plans for the brand to expand its legacy include much-anticipated St. Regis hotels and resorts in Asia, where St. Regis has announced plans to open hotels in Changsha, Haikou Jakarta, Kuala Lumpur, Langkawi, Lijiang, Macao, Nanjing, Qingshui Bay, Sanya Haitang Bay and Zhuhai. Additionally in Europe and the Middle East, St. Regis will continue to expand in Amman, Astana and Dubai. For more information on St. Regis Hotels & Resorts, please visit www.stregis.com, for the privilege of residential ownership, please visit www.stregis.com/residences, and to learn how the brand celebrates the art of play visit www.stregis.com/familytraditions. Connect with St. Regis on Facebook, Instagram, Pinterest, Twitter, and YouTube.